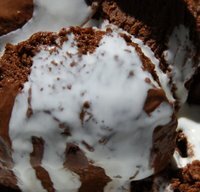 This Chocolate icecream recipe came from the Island of Minorca, that little jewel in the Mediterranean. My friends Grandmother, who is half Italian, made it for her Grandchildren as a treat.....of course they all adored it. After tasting this rich, silky, chocolate icecream I was hooked. She very kindly told me how she made it.... after a little persuasion, and I have adapted it to make a quick and easy, step-by-step recipe. Beware Chocoholics....once you taste it you will be its slave! Its based on the same custard recipe that I use for all my ices....this is the secret of that wonderfull smooth mouthfeel. In a saucepan slowly heat the cream to just under boiling point....Do not allow to boil. In a mixing bowl whisk together the egg yolks, sugar and cornflour until thoroughly mixed. Pour the hot cream on to the egg mixture little by little whisking all of the time, until all of the cream has been added. Pour this mixture back into the pan and add the chocolate. Return pan to medium heat and stir constantly until the chocolate has melted and the custard has thickened. It should just coat the back of your wooden spoon. It needs to be quite hot for this to happen, but do not allow it to boil or it will scramble. Remove from heat and pour into a bowl covering the surface of the custard with cling film...this prevents a skin forming. See vanilla ice cream recipe for step by step photos. When this is cool, put into the fridge to chill. If you want a creamier chocolate ice cream fold in the Greek Yogurt before pouring into your Ice Cream Maker*. Churn for 20 -30 minutes until thick. Pour into a suitable plastic container with a lid. Store in freezer until required. Its a good idea to take this ice cream out of the freezer 10 minutes before serving as it is a lot easier to scoop. 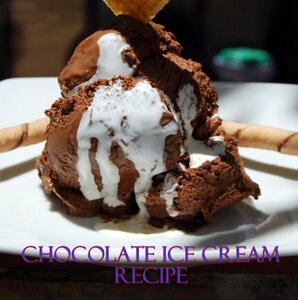 *Do not be put off trying this chocolate icecream recipe if you do not have an ice cream maker. Simply pour your chilled custard mixture into a suitable plastic container and put into the freezer. Every hour give it a good stir...eventually it will get to ice cream consistency. If it goes too hard, put it into a bowl and whisk with an electric beater...or whizz in a food processor. Return to plastic container and freeze.